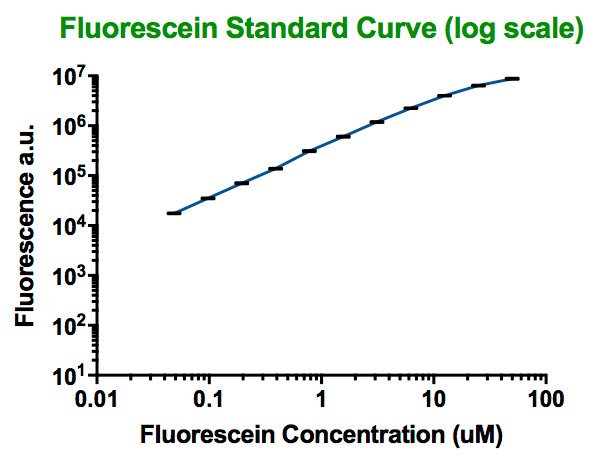 Below is the Fluorescein Standard Curve we obtained, from which we can still see the problem of saturation. We also converted the calibrated data of the time-measurement into a uM Fluorescence a.u./ OD600 versus time graph. 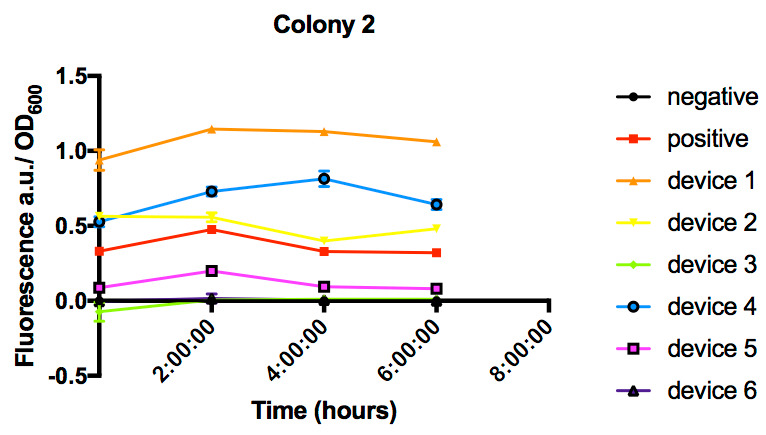 Besides Device 1 and Device 4, all the others constructs show consistency of standardized fluorescence level in the two colonies over time. From our experiment, we conclude that that BBa_J364100 is a stronger RBS, with an increase of 32.0%, 74.2% and 16.2% expression under J23101, J23106 and J23117 respectively compared to BBa_B0034. The Standardized RBS tested in this experiment, BCD (bicistronic design) 2, is a synthetic cistron leader peptide region that contains two Shine Dalgano sequences that is reported to have increased precise and reliable translation initiation . Device 1 and 4, 2 and 5, and Device 3 and 6 feature the same strong (J23101), medium (J23106), and weak (J23117) promoters from the well-characterized Anderson promoter family in the iGEM registry. Device 1-3 are under standard RBS BBa_B0034, (which William_and_Mary iGEM 2016 has proudly characterized), while Device 4-6 incorporate the test subject BBa_J364100 (BCD2). 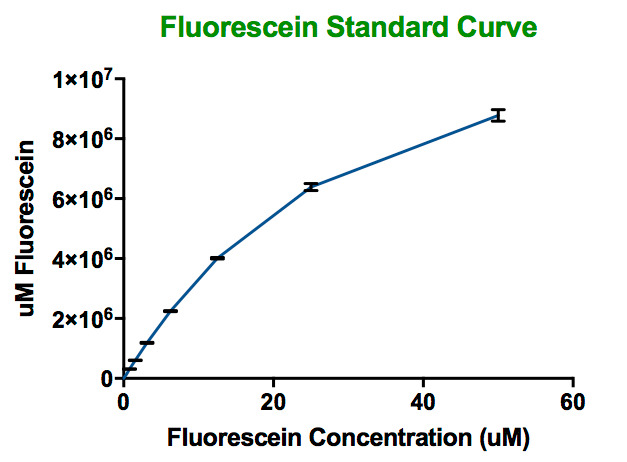 Since all of the devices are under constitutive promoters, we assumed fluorescence expression to be consistent over time in an optimal growth condition (37°C in LB media). 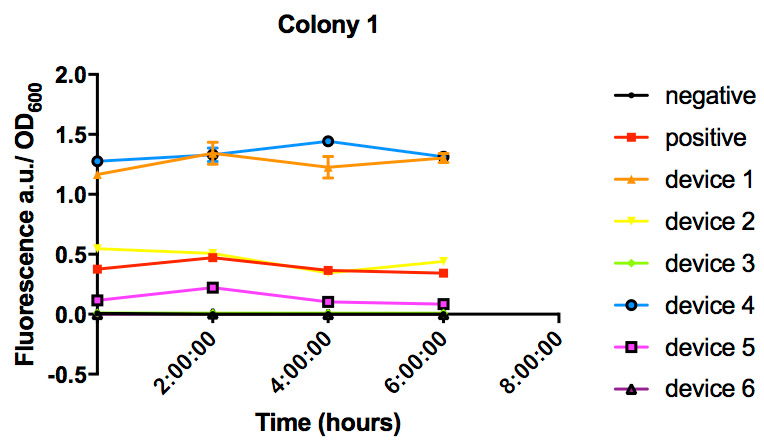 We compiled a total of 48 data values of all 4 time points and 2 colonies of the same RBS and did an anova test for BBa_B0034 and BBa_J364100 and obtained a p-value of .085. The failure to get a significant difference between groups may be due to a small sample size or limitations to plate reader measurement. Since Device 1 and Device 4 account for most of the variation, and both are under the same promoter, another possible explanation would be the context dependent performance of J23101, and an insulator part may be needed to further investigate properties of this RBS if the same problem occurs across different teams . We thank the iGEM Measurement Committee again for providing us with the excellent opportunity to be a part of this study and look forward to seeing the study results when data from all participating teams are put together.